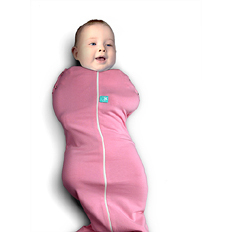 An easy option for swaddling a baby. Babies will feel secure and snug with stretch organic cotton. It allows babies to move their hands into a comfortable position that suits them without waking up. Now with poppers in the arms for an easy transition into a sleeping bag. The ergococoon gives babies the option of sleeping arms free or tucked in. Launch date: 2010.